Welcome to this week’s Bill’s History Corner. I think it is interesting when we find information of the personal nature about the principal members of the Coppes, Zook or Mutschler Families. We literally have thousands of old business receipts from the company in the first part of the 20th century (1903-1920). Don’t know how it could have happened, but several boxes of receipts were misplaced or lost until we discovered them while digging in the factory’s junk. What a find, and are we grateful, obviously. Most of the business receipts were destroyed or we would have found other hordes of receipts. Stay tuned. Who knows what we will find. The business receipt I want to talk about today is an item that was purchased for H. (Harold) Coppes while he was in college in Ann Arbor, Michigan. Likely the class he was taking was a drafting or engineering class. Harold must have needed some drawing tools for the work in the class, so they/he ordered a set of drawing instruments (No. 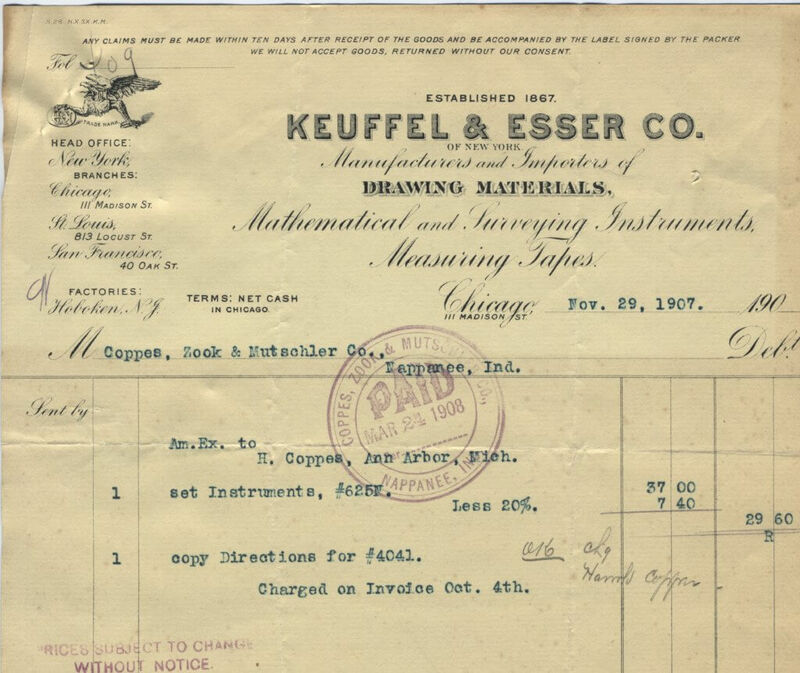 625) from the Keuffel & Esser Co., Chicago, ILL. This was a very large company that imported or manufactured a wide range of tools like drawing instruments. The set of instruments that were ordered was priced at $37.00 but there was a 20 % discount given. Likely that discount is the reason the drawing set was ordered through the company rather than just H. Coppes, as an individual. So, Harold saved $7.40 in the transaction by purchasing a top of the line drawing set. Below is a scan of the Nov. 7, 1907 receipt. Did he need such a high-end drawing set to do the work in the class, or could he have been just as well off with a less expensive set? We will never know the answer to that question. What we do know is that later in 1916 Harold was the motivation behind a patent application for a flour bin used in a Coppes Napanee kitchenet. 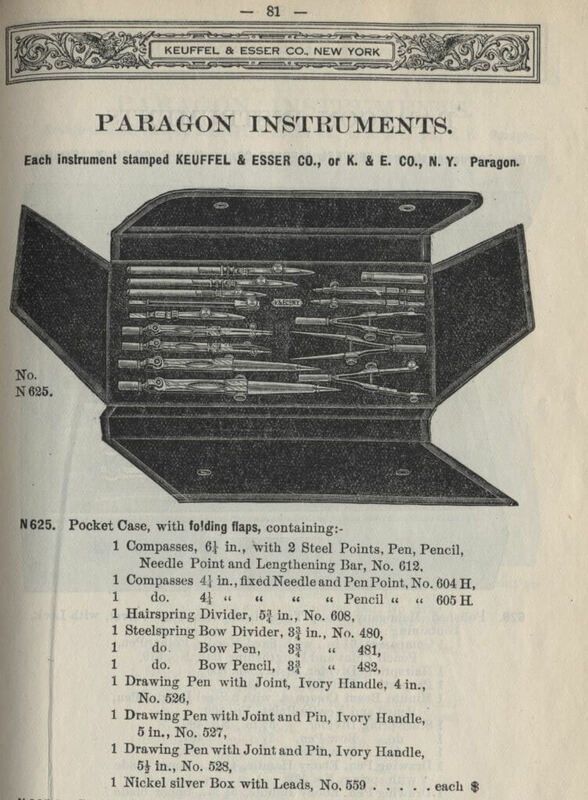 How many of the skills that Harold Coppes demonstrated later in his life did he learn by using that drawing set purchased in 1907? I have scanned a page from a K & E catalog showing a Number 625 drawing set (below). We could speculate all day about things like this- makes history interesting.